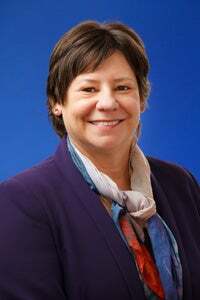 Hi, I’m Megan Mitchell, the National Children’s Commissioner. My job is to protect the rights of all children and young people in Australia and make sure that adults do everything they can to help children and young people grow up healthy and strong. 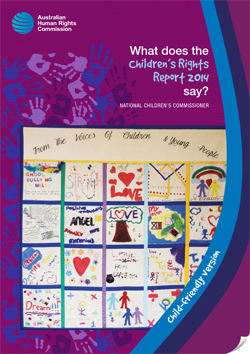 I use a document called the Convention on the Rights of the Child to help me in my work. (You can find out more about the Convention here). The Convention sets out all the things that children have the right to expect in order to live happy and healthy lives. This includes thing like being treated with dignity, being safe from abuse and exploitation, having a family to care for you, knowing your identify and culture, and having access healthcare and education. The Convention is very important because it gives special rights to every child, it has been signed by nearly every country in the world, and it puts a duty on adults to make sure these rights can be enjoyed by children and young people. I am interested in hearing from all children and young people in Australia! So let me know what is important to you by writing to me at: kids@humanrights.gov.au. 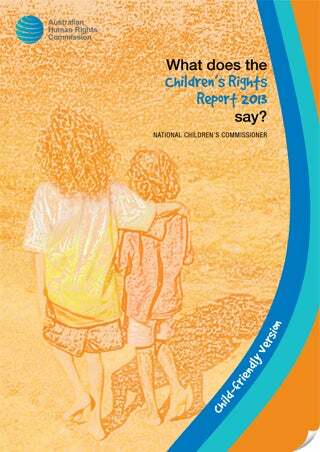 Every year, I write a report to the Australian Government about the state of children's rights in Australia. In my report I make recommendations about how I think we can better look after all children and young people. As well as writing a report for the politicians, I also write one for you! 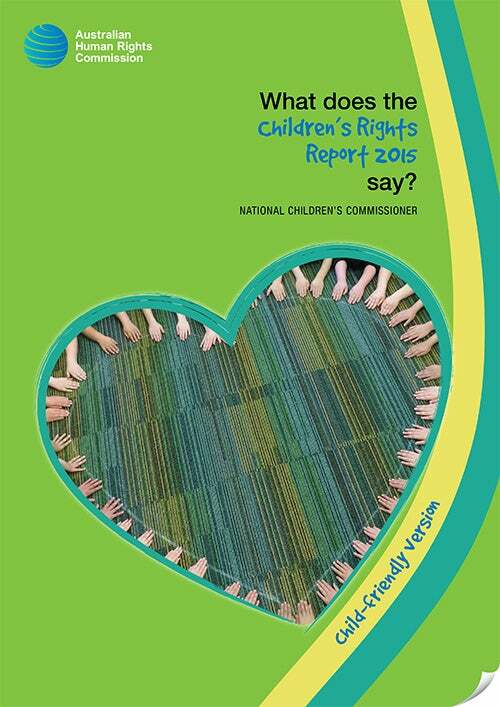 You can read the child-friendly versions of my reports here. In 2013, in my first year as the National Children’s Commissioner, I went around Australia listening to children and young people. I met over 1,000 children and young people. About 1,400 children and young people also filled in surveys and sent me postcards. I asked them what was important to them and what would make life better. I heard stories from adults who work with children and young people too. After I had listened to all the great things that children, young people and adults had to say, I came up with five main ideas. These ideas are helping me do my work. We need to make sure that adults listen to children and young people and take their views seriously. We need to make sure that all children and young people are safe. All children and young people need to grow up strong, healthy and happy. We need to help children and young people who are having a really hard time right from the start, instead of waiting until the problems get really bad. We should help children and young people get involved in their schools and communities – to be citizens! They need to know about their rights! We need to know all about how children and young people are doing in Australia. Then we need to make sure that the Australian Government makes laws and rules which help all children and young people. This year I paid special attention to the human rights of young children who are in early education and care. It’s important to make sure that children know about their rights as early as possible. Children can use their rights to tell someone if they don’t feel safe and to have a say about things that matter to them. People working with young children should listen to young children and help them to learn about their rights and to have all the things they need to do well. I also spoke to children and young people about privacy. All children and young people have the right to privacy and in Australia there are rules about this. Privacy rules can be broken when someone goes into your home without being asked, when you are being watched without you knowing, or when someone uses information without you agreeing. After I spoke to children and young people about privacy rules, I shared what they said with adults working to make better privacy rules. Everyone gets worried and upset sometimes. Children and young people have a right to life and health, and help if they need it. This year I learned a lot about what worries and upsets children and young people. Some children and young people get so upset that they hurt themselves. I spoke to young people and adults about how we can make sure children and young people get better help. to be respected and listened to. This year I looked at how children and young people are affected by family and domestic violence. For most children and young people, home is a place where they feel safe, protected and loved. However, some children and young people don’t feel safe in their own home. Disagreeing about things is a regular part of family life. Sometimes your parents might have disagreements about money or who does chores around the house. You might argue with your mum or dad, or brother or sister, about a lot of different things. But sometimes arguments in families go too far and people can get hurt. Sometimes children and young people see members of their family, like one of their parents, getting hurt. Sometimes children and young people are the ones who are getting hurt. Violence in families has a big effect on everyone, especially children and young people. There’s no excuse for family and domestic violence. It is never OK.
All children and young people have the right to be safe. I will be working with the Australian Government to help make sure that children and young people are safe and protected in their homes. What if you are in danger of getting hurt or are worried about getting hurt? Do you know where to go to get help? If you think you are in immediate danger, get the police by dialling 000. If you don’t feel safe at home or you are worried that other members of your family are not safe, there are lots of ways you can get help. You can talk to someone you trust, like a friend or a teacher. If you wanted to talk to someone on the phone, you can call Kids Helpline on 1800 55 1800.
on the phone by calling 1800 650 890.